You can use HTML Composer to create an HTML page that launches and displays your reports and graphs. You can add elements to the HTML page, such as reports, graphs, text, and controls. You can also set properties for the HTML page in HTML Composer. For details, see Setting HTML Page Properties. You can add reports and graphs to HTML Composer that will display when you run the layout. You can add a new report (that you create in Report Painter), a new graph (that you create in the Graph tool), or add an existing report or graph that resides on an available server. You can also launch Document Composer from HTML Composer and create compound documents. You can also include parameters in a report or graph whose values can be assigned with controls that are added with HTML Composer. For information, see Using Controls to Supply Incoming Parameter Values. You can set the graphic used as a placeholder for a report or graph in the layout using the HTML Page tab, located in the Developer Studio Options dialog box. For details, see How to Set Page Properties. In order for a graph to fit an HTML Composer frame properly at run time, in InfoAssist, you must select the Autofit command and verify that any graph headings are embedded. You must also embed the graph, into the HTML page, using the Import existing graph command. You can reference an existing graph in your HTML page. To ensure the entire graph is displayed without the need to scroll, you must resize the frame so the entire graph fits. InfoMini procedures cannot be referenced in an HTML page. Click the Report or Graph button from the Components toolbar. From the Insert menu, select New Report or New Graph. Right-click in the layout and select New Report or New Graph from the context menu. A report or graph object is created in the layout and assigned the name report(n) or graph(n), where n is a number. The object will appear in gray and white to indicate that the placeholder does not have a report or graph associated with it. Once a report or graph is associated with the object, the object displays the contents of the report or graph if live or simulated data is active (live data is the default) or a colored placeholder if preview is off in the HTML Page tab, located in the Developer Studio Options dialog box. Right-click the placeholder and select New Report for a report, or New Graph for a graph. Select the Master File you want to report against from the Master File list, and click Open. The selected tool opens. For details on using these tools, see the Creating Reports With Report Painter manual and the WebFOCUS InfoAssist User’s Manual . Optionally, after creating the report or graph, you can change its properties by adjusting the properties displayed in the Properties tab of the Properties window. For details, see Report Properties in the Properties Window. The cursor changes into a crosshair. Drag the crosshair to create a report or graph object and adjust it to the size you want. From the Insert menu, select Import Existing Procedure. Note: To access the Manage Layout dialog box, choose this method. 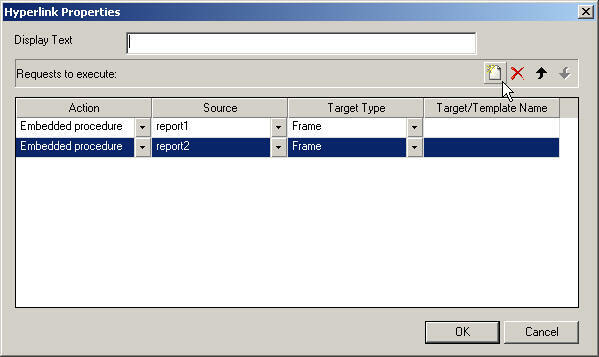 For a report, right-click the report object and select Import existing report. For a graph, right-click the graph object and select Import existing graph. Enter the name of the procedure you want to add to the layout. The report or graph object appears in the Design view of HTML Composer. To edit the report or graph, double-click the object. Open the report or graph, and make any necessary changes. Close the Procedure Viewer to return to HTML Composer. Optionally, change the properties by adjusting the properties displayed in the Properties tab of the Properties window. For details, see Report Properties in the Properties Window. When a report is selected, the Properties tab in the Properties window contains options that control the properties of your report and reporting objects. When a graph is selected, the Properties tab in the Properties window contains options that control the properties of your graph. Click the Report button from the Components toolbar. From the Insert menu, select New Report. Right-click in the layout and select New Report from the context menu. Right-click the report object and select Open document composer from the context menu. Document Composer opens. For details on using Document Composer, see the Creating Compound Reports With Document Composer manual. You can select to include or exclude components to be imported into your procedure with the Manage Layout dialog box. The Manage Layout dialog box allows you to select from components of your request, such as TABLE, SET, and GRAPH. 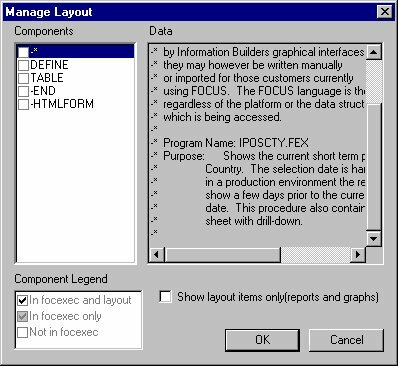 If you have several requests in one procedure, you can use the Manage Layout dialog box to suppress the display of individual TABLE, SET, and GRAPH components (for example, temporary HOLD files). By default, the last TABLE is set to display. Select Import Existing Procedure from the Insert menu. Select a file name and click Open. The Manage Layout dialog box opens. For details, see Manage Layout Dialog Box. The following image is the Manage Layout dialog box. Displays all the components (SET, DEFINE, and so on) in the request. Displays the contents of the selected component. Determines whether the request is included in the procedure, outside of the procedure, or in the procedure and layout. Activates the component and displays the component in the layout. Deactivates the component and does not display the component in the layout. This is a good method for hiding report requests that produce temporary files. Removes the component from the procedure. Displays the layout reports and graphs in the Data field. This check box only displays when you access the Manage Layout dialog box from the Insert menu. When accessing it from the context menu, only the report or graph component displays, and the check box does not apply. You can use a frame to embed additional web sources or run reports. You can also use a frame as the output location or target for a drill-down report. You can also use a frame to run a table of contents report, an OLAP report, a PDF report, an Excel® report, or a Maintain procedure. 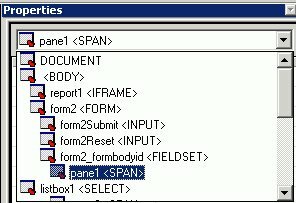 From the Insert menu, select Components, then click Frame. Drag the crosshair to create a frame and adjust it to the size you want. A frame is created in the layout and assigned the name iframen, where n is a number. Optionally, change the properties of the frame by adjusting the properties displayed in the Properties tab of the Properties window. For details, see Frame Properties in the Properties Window. A frame is created in the layout and assigned the name iframe(n), where n is a number. Right-click the frame, and select Frame Properties from the context menu. URL. To assign a URL address to the frame, select URL and enter the fully-qualified URL in the Source field. HTML File. To assign an HTML file to the frame, click select HTML File and enter the file location in the Source field, or click the browse (...) button to browse to the location. An HTML file refers to the HTML files in your application. External procedure. To assign an external procedure to the frame, select External procedure and enter the procedure location in the Source field, or click the browse (...) button to browse to the location. You can also select Maintain procedures (.mnt, .fcm) here. From HTML Composer, use the controls to supply parameter values for a report. Note: A report with parameters requires that you select values (at run time) in order to generate the output. Click the frame (report object) and select False from the Auto Execute drop-down list in the Properties tab of the Properties window. Note: False is the default Auto Execute option for reports with parameters. Right-click the frame (report object) in the Design view and select Style from the context menu. Select Layout from the left side of the Style Composer to view the layout options for the selected frame. From the Flow control area, select Do not display from the Display drop-down list. This option hides the frame at run time until the values are selected. In the example below, the frame is not shown before the values are selected. In the same example below, parameter values have been selected and the frame appears showing the output results. When a frame is selected, the Properties tab in the Properties window contains options that control the properties of frames. You can add a horizontal or vertical line to the layout. This is useful for distinguishing between sections of your launch or display page. From the Insert menu, select Components, then click Line. Drag the crosshair to create a horizontal or vertical line. A line is created in the layout. Optionally, change the line properties by adjusting the properties displayed in the Properties tab of the Properties window. For details, see Line Properties in the Properties Window. When a line is selected, the Properties tab in the Properties window contains options that control the properties of lines. You can add an image to the layout. This is useful for including graphics, such as a company logo. You can insert an image into your report layout and add a hyperlink to it. After you run your report and click the image you can launch a URL or run a report or Maintain procedure the same way you can by clicking a hyperlink or push button. For more information, see How to Add a Hyperlink to a Push Button or an Image. Note: When inserting images, images must be referenced from a specific directory location. Links to images are not supported. Click the Image button from the Components toolbar. From the Insert menu, select Components, then click Image. Drag the crosshair to create the image object and adjust it to the size you want. Navigate to the directory where the image is located using the Look in drop-down list, then select the image you want to add to the layout. You may also specify a fully-qualified URL or a relative URL that points to an image file by entering it in the File name area. A fully-qualified URL must start with http:// or https://. A relative URL must start with a known context root that WebFOCUS uses, such as /approot/appname/imagename.png. You can multiselect image files from the Get source files dialog box. The files will be cascaded on the canvas and can then be moved as required. Optionally, change the properties of the image by adjusting the properties displayed in the Properties tab of the Properties window. For details, see Image Properties in the Properties Window. Note: You can always return an image to its original size by right-clicking the image and selecting Restore size from the context menu. Images will retain their aspect ratio if they are resized by pressing and dragging their corner borders. When an image is selected, the Properties tab in the Properties window contains options that control the properties of selected images. You can add .SWF files that are Adobe® Flash Player compatible to accompany reports or graphs on an HTML page. When inserting Flash animations, only files that are 1 MB or smaller can be run using HTML Composer. Internet Explorer® 6 does not support the use of Flash content. Click the Insert Flash Content button from the Components toolbar. From the Insert menu, click Components, then click Flash Content. Drag the crosshair to create the Flash content object and adjust it to the size you want. Navigate to the directory where the .SWF file is located using the Look in drop-down list, then select the .SWF file you want to add to the layout. Optionally, change the properties of the Flash content by adjusting the properties displayed in the Properties tab of the Properties window. Click Run to view the flash content. When Flash content is selected, the Properties tab in the Properties window contains options that control the properties of the Flash component. You can add text to the layout. This is useful for including headings in your webpage, or adding directions or an explanation for your report or graph. Click the Text button from the Components toolbar. From the Insert menu, select Components, then click Text. Drag the crosshair to create the text object and adjust it to the size you want. A text object is created in the layout and assigned the name textn, where n is a number. Replace the text with the text you want to appear in the layout. Optionally, change the text properties by adjusting the properties displayed in the Properties tab of the Properties window. For details, see Text Properties in the Properties Window. You may apply various formatting and style options to words and individual text characters within the text element. The formatting options are available from the text element shortcut menu in HTML Composer. Note: Any formatting and styling that you may have applied to individual text strings within the text element will remain unchanged. Changes made to the entire text element are only applied to part of the text string that has not been formatted. Insert a text element into the layout and type text in the text element. Select the text that you wish to format. To format the entire text element, click the text object in the layout. To format an individual word or text character, highlight part of the text within the text element. The Formatting toolbar is activated. Note: The Bold, Italic, Underline, Superscript, and Font Style options are available when formatting individual words or text characters. The Font Style and Alignment options are available when the entire text element is selected. Select from the formatting options available from the Formatting toolbar. Select Font Style from the Formatting toolbar to open the Font dialog box, from which you can change the type, style, color, size, and effect of the font. Tip: You can also access the Font Style dialog box from the Font ellipsis button of the Styling Font field in the Properties window. Click OK to close the Font dialog box. The format options are applied to the text selected. Insert a text element into the layout and enter text on different lines, as shown in the following image. Highlight and right-click the text. The right-click context menu opens. Select Bullets and then either Disc, Circle, or Square if you want a bulleted list. Select Numbering and then either Numbers, Lowercase Letters, Uppercase Letters, Small Roman numerals, or Large Roman numerals if you want a numbered list. Both options are shown in the following image. For example, the following image shows each item of text on a different line with a bullet next to it. Alternatively, you can select a bullet type before typing text to begin the list. Pressing Enter will begin the next item in the list on a separate line. To change the bullet or number list type of an existing list, place your cursor on the list level you want to change and reselect a bullet or number list type. Selecting None will remove the bullets or numbers for that level and move any nested lists up one level. In order to switch between bullets and numbers, you must first remove the current list option by selecting None and then applying the list option you want. Insert a text element into the layout and create a list, as shown in the following image. Place your cursor after a list item. Right-click and select Nested List and then select a bulleted or numbered list option. A list is started within the current list, allowing you to enter text on that list level, as shown in the following image. Note: Pressing Tab while your cursor is on the same line as a list item will move that item one level down, resulting in a nested list. The bullet or number type selected is the next list type in the right-click context menu. For example, if you have a bulleted list that uses the disc bullet type, pressing Tab to move an item down one level will cause that nested list to have a circle bullet type. You can continue to nest lists within other lists by using the same steps shown above. Note: You cannot skip a list level. For example, in order to insert a nested bulleted list or nested numbered list on a lower level, there must be a list one level up from it. When text is selected, the Properties tab in the Properties window contains options that control the properties of the text component. Insert a hyperlink. For details, see How to Create a Hyperlink. Add a hyperlink to a push button or image. For details, see How to Add a Hyperlink to a Push Button or an Image. 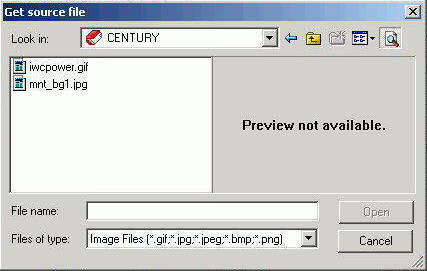 The following is an image of the Hyperlink Properties dialog box. The URL action will create a hyperlink that brings you to a webpage. This action will allow you to enter a URL in the Source section. The HTML File action will create a hyperlink that will bring you to an HTML Composer page. You will be able to select the HTML file to link to from the Source section. The URL File action will create a hyperlink that will invoke a Managed Reporting .url file. You will be able to select the .url file to link to from the Source section. This action is only available if you are creating an HTML page hyperlink in the Repository area. The Embedded Procedure action will link to a procedure that is already embedded in the page. The Source section will allow you to choose from the procedures already linked to the current page. The Schedule action enables you to schedule a report or graph using ReportCaster. For more information on using scheduling, see Adding ReportCaster Schedule Capability to HTML Composer. The External Procedure action will link to a procedure that is not embedded in the page. You must navigate to and specify the procedure from the Source section. The Visual Discovery Exclude action is only available when a Visual Discovery control is used on the page. From the Source section, you will be able to choose a datapool already located on the page. This action will cause the currently Visual Discovery data to remain, while hiding the unselected data. The Visual Discovery Restore action is only available when a Visual Discovery control is used on the page. From the Source section, you will be able to choose a datapool already located on the page. This action will cause hidden Visual Discovery data to be shown on the Visual Discovery control. The Refresh Active Reports action is only available when an Active Report is on the page. This action will refresh all active reports currently on the page. The source of where the hyperlink directs to. For URL actions, this is a hyperlink. For HTML actions, you will need to navigate to the HTML file you are directing to. For the Embedded Procedure action, this would be a selection from a list of available procedures. For the External Procedure action, you would have to navigate to the procedure you are directing to. The Window Target Type will execute the action in a new window. The Frame Target Type will execute the action in a selected frame. The Deferred Target Type will run the report deferred. 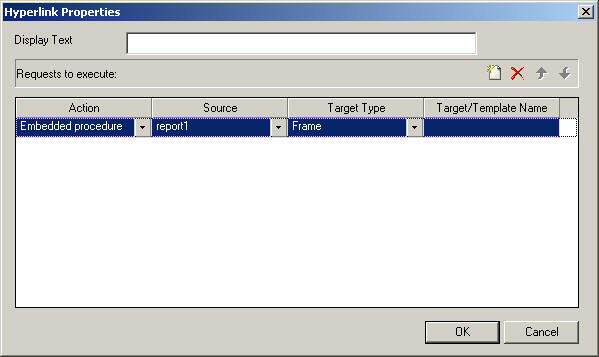 The InfoWindow Target Type will execute the action in the WebFOCUS generated InfoWindow. 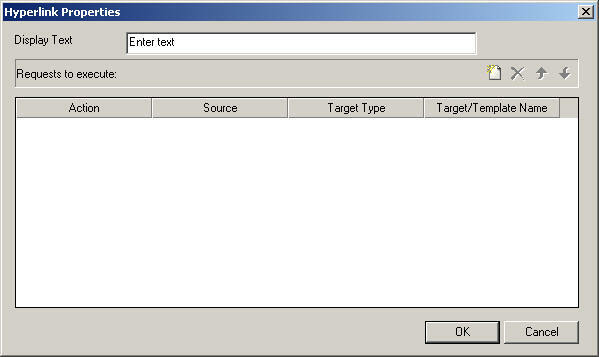 The Target/Template Name contains a list of targets in which the action can be executed from. These targets can be controls, frames, windows, or distribution methods when the Action is set to Schedule. These options can be different for specific actions. Note: If the distribution method is a combination (for example, email, report library, and FTP) then, at run-time, you will be presented with an intermediate dialog requesting you to choose a single distribution method. Allows for customization of the InfoWindow dimensions. This option will replace Target/Template Name when using InfoWindow as the Target Type. When a parameter is added to the HTML page, the Additional parameters button becomes available at the bottom of the Hyperlink Properties dialog box, as shown in the following image. The Additional parameters button lets you pass the selected parameter in the hyperlink being defined. Clicking the green OK button selects the parameter. Clicking the red Cancel button closes the parameter drop-down list. Click the Hyperlink button from the Components toolbar. To link to a URL, select URL in the Action section, and enter the URL in the Source field. To open an HTML page, click select HTML in the Action section, and enter the HTML page in the Source field. To execute an embedded procedure, select Embedded procedure and enter the procedure name in the Source field, or click the browse (...) button to browse to the procedure. To execute an external procedure, select External procedure and enter the procedure name in the Source field, or click the browse (...) button to browse to the procedure. You can also select Maintain procedures (.mnt, .fcm) here. To refresh or repopulate active reports based on selected values in active controls, select Refresh active reports and specify the source or which active report(s) should be refreshed. For more information about active controls, see Creating Active Technologies Dashboards With HTML Composer. Optionally, direct the output to a specific location by selecting Window or Frame in the Target Type field. Specify a name for the target window or frame by selecting one of the default values from the Target/Template Name drop-down list or by typing the name of a new or existing window or frame in the Target/Template Name field. Note: If linking hyperlink properties to another page or procedure, HTML Composer parses the other file for unresolved parameters and opens the New Parameters dialog box. Execute the request and click the hyperlink to launch the source you entered in the Hyperlink Properties dialog box. Note: If your hyperlink target type is an InfoWindow, you can move the InfoWindow by clicking the title bar and dragging it. You can move the InfoWindow regardless of if it is pinned or unpinned. To add a hyperlink to a push button or image, complete the following steps. Insert a push button or image from the Components toolbar and add it to the layout. Right-click the push button or image, and select Create hyperlink. The Hyperlink Properties dialog box opens. Click the New button to generate a new request and select URL from the Action drop-down list. Type a URL in the Source field. Optionally, in the Target Type field, direct the output to a specific location by selecting Window or Frame from the drop-down list. In the Target/Template Name field, specify a target window or frame by selecting one of the default values from the drop-down list or by typing the name of a new or existing window or frame. Execute the request and click the push button, or image, to launch the source you entered in the Hyperlink Properties dialog box. A group box can be used to create a border around a group of objects, for example, forms or reports and graphs. Click the Group box button from the Components toolbar. From the Insert menu, select Controls, then click Group Box. Drag the crosshair to create a group box and adjust it to the size you want. A group box is created in the layout and assigned the name groupbox(n), where n is a number. Optionally, you may change the default name of the group box and format the text, as shown in the image below. For more information about formatting text, see How to Format Text in the Layout. Optionally, change the group box properties by adjusting the properties displayed in the Properties tab of the Properties window. For details, see Group Box Properties in the Properties Window. When a group box is selected, the Properties tab in the Properties window contains options that control the properties of group boxes. You can add a push button to the layout. A push button enables you to execute a report or Maintain procedure, or link to a URL or HTML file. This behavior is similar to a hyperlink. Click the Push Button from the Components toolbar. Drag the crosshair to create a push button and adjust it to the size you want. A push button is created in the layout and assigned the name button(n), where n is a number. Right-click the push button and click Create hyperlink. The Hyperlink Properties dialog box opens. Use the Hyperlink Properties dialog box to assign a target and action to the push button. Click the push button to submit your request. The submit button on a control enables you to submit your request after selecting parameter values at run time. You may run multiple reports with one submit button. Note: A push button can also be used in place of a submit button. Right-click the submit button or the frame for the whole control, and select Create hyperlink from the context menu. The following image is an example of the submit button selected. The following image is an example of the whole control selected. Click the New button and use the drop-down lists to add the second report request to be executed with the submit button. Repeat these steps for multiple procedures. When a push button is selected, the Properties tab in the Properties window contains options that control the properties of your buttons. HTML Composer enables you to select Maintain procedures (.mnt, .fcm) to run from your HTML form, either within a frame or in a new window. 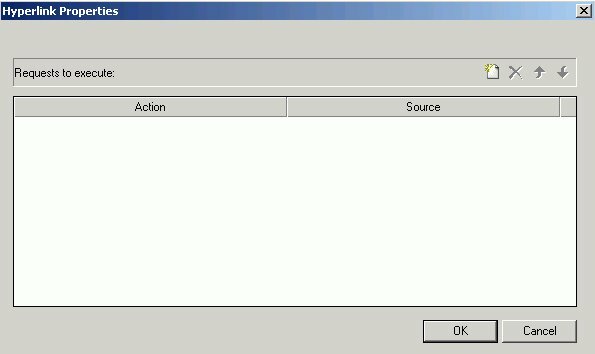 Select a Maintain procedure as the source for the External procedure in the Hyperlink Properties dialog box. This makes it easy to create customized launch forms for WebFOCUS Maintain, and to integrate WebFOCUS reporting and Maintain in your applications. For details about inserting a frame, see How to Assign a URL, HTML File, or Report to a Frame. You can add a reset button to the layout. A reset button enables you to reset the entire page back to its initial settings. Click the Reset button from the Components toolbar. From the Insert menu, select Controls, then click Reset Button. Drag the crosshair to create a reset button and adjust it to the size you want. A reset button is created in the layout and assigned the name reset(n), where n is a number. When selecting criteria to submit a report, click the reset button to reset the entire page back to its initial settings. When a Reset button is selected, the Properties tab in the Properties window contains options that control the properties of your buttons. You can add a tab control to the layout. Tab controls enable you to create multiple pages in one HTML form and present a better display for viewing secondary information. A tab item is the tab label. You may edit the name of the tab item, style the tab item, and add multiple tab items. Each tab item is associated with a tab body. A tab body is the tab page where you associate your components, such as report and graph objects, images, and lines. The Tab control can be displayed as a full screen or part of an HTML page. In the example below, the selected tab shows a report and a second tab that contains a graph. Click the Tab control button from the Components toolbar. From the Insert menu, select Components, then click Tab Control. Drag the crosshair to create a tab control object and adjust it to the size you want. Tip: You should make the object large enough to associate report/graph components within the tab control. A tab control object is created in the layout and assigned the Properties name tab(n), where n is a number of the tab. By default, the tab control has one tab page. Each tab page consists of a tab item (tabitem(n)) and tab body (tabitembody(n)). Optionally, change the properties of the tab control by adjusting the properties displayed in the Properties tab of the Properties window. You may resize the tab control to fit the full screen of your layout, making the tab control the full background of your browser window at run time. When set to full screen mode, scroll bars will not be applied to the output window. Therefore, you may have to adjust the tab control (and any items on the tab) in the layout to ensure that they appear appropriately for display at run time. Note: It is recommended you set the tab control to full screen mode at the beginning of the development process. If there are existing components on the layout that are not part of the tab control, these components will become inaccessible if the tab control is changed to full screen mode. Drag the crosshair in the layout to create the tab control object. Right-click the tab control and select Full screen mode from the context menu, as shown in the image below. The tab control displays as a full screen in the layout, as shown in the image below. Note: This setting can be applied only to one tab control in your application. If one tab control is set to full screen mode, the full screen mode item will be greyed out for any additional tab controls. To resize the tab control, right-click and uncheck the Full screen mode option, as shown in the image below. Select the tab control object in the layout. Right-click and select Add tab item from the context menu. A tab is added to the tab control object. The tab items are resized to the size of the widest tab item and evenly spaced. When a tab control is selected, the Properties tab in the Properties window contains options that control the properties of your tabs. Note: You may set options for the tab control, individual tab items, and the tab body. You may modify and style the tab items and tab body properties. Use the Formatting toolbar to format the text in the tab item. Click the tab item/tab body and use the right-click context menu to edit the text (if applicable), Font Style, Style, and Properties. When the tab control is selected, you may change the default size of the tab labels, the appearance of the tabs, and the location of the tab items on the tab control. These properties are available from the Properties tab of the Properties window when the tab control is selected. The tab control appears as tab(n) in the Properties window drop-down list. To change the default size of the tab labels, adjust the Tab: default distance, Tab: default height, and Tab: default width properties. To change the appearance of the tabs, select Straight or Round from the Tab: edges properties field. The default tab edge is Straight. To change the location of the tab items on the tab control, select Top, Bottom, Left, or Right from the Tab: location properties field. The default tab location is Top. Note: If the tab location changes, any background images applied to the tabs will not be rotated. You will have to reinsert a different image that is rotated appropriately. 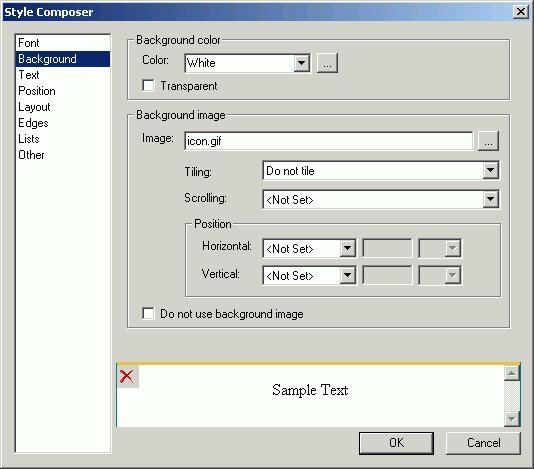 In addition to using the Style Composer, you can add background images to tab items by using the Background properties field. The Background properties field is available from the Properties tab of the Properties window when the tab item is selected. The tab item appears as tabitem(n) in the Properties window drop-down list. Select the tab item in the layout, or click the tabitem(n) property from the Properties window drop-down list. Click the Background ellipsis button from the tab item properties window. The Get source file dialog box opens, as shown in the image below. The background image is added to the tab item. You may have to manually resize the tab item to fit the image. Note: If the tab location is changed (from Top to Left for example), any background images applied to the tabs will not be rotated. You will have to reinsert a different image that is rotated appropriately. You may add background images to a tab item or tab body using the Style Composer. For example, you may add a small icon with text to a tab item or your company logo as the background image for a tab body. Note: Background images can also be applied to tab items by using the Background properties setting. For more information, see How to Use the Tab Item Background Properties Field. Select Style from the right-click context menu of the tab item/tab body. 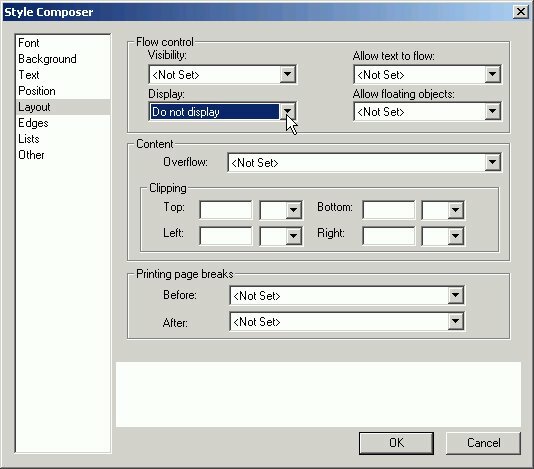 The Style Composer dialog box appears. Select Background to show the Background image options. Select a source file in the Image field and adjust the Tiling, Scrolling, and Position options. Tip: If you are adding an icon to a tab item, select a small image and do not tile the image. If you are using text in addition to a background image for a tab item, select Text from the Style Composer to view and change the Alignment options. The background image is added to the tab item/tab body. You may associate any component from the Insert menu (such as an image or line) to the tab body. This procedure details how to add a report or graph object component to the tab body. Select New Report or New Graph from the Insert menu. In the tab control body, drag the crosshair to create the report or graph object and adjust it to the size you want. Open, import, or reference a report or graph procedure. Select the component in the layout. Press the Alt key and drag the component into the tab body. The component is associated to the tab body. You can add a label to the layout. A label is simply a piece of text. The label component enables you to create and name a label. You can also link it to a control by assigning the label HTML for property the same value as the Unique Identifier property for the control. Click the Insert Label button from the Components toolbar. From the Insert menu, select Components, then click Label. Drag the crosshair to create the label and adjust it to the size you want. A label is created in the layout and assigned the name labeln, where n is a number. Replace the label text with the text you want to appear in the layout. Select the label in the layout. Select the HTMLfor property field in the Properties tab of the Properties window. Type in the Unique Identifier property name for the control you want to link the label to. For example, suppose you have a drop-down list in your layout. The default Unique Identifier property name assigned to the drop-down list object is combobox1. Enter combobox1 in the HTMLfor property field to link the label to the drop-down list in your layout. Optionally, change the label properties by adjusting the properties displayed in the Properties tab of the Properties window. For details, see Label Properties in the Properties Window. When label is selected, the Properties tab in the Properties window contains options that control the properties of the label in your layout. New pages will show labels as <LABEL> tags in the Properties window. The Properties window is a dockable window that consists of several tabs and components. A hierarchical drop-down list of objects that are currently in the layout. For the selected object, there are additional subtabs on the Properties tab. A Properties subtab that lists attributes for the selected object. The attributes appear on the left. Click in the right column to set the properties for the attribute. The Properties subtab options are accessible in the Design view of HTML Composer. A Thumbnails tab enables you to view a thumbnail of the page layout. Thumbnail view allows objects on the page to participate in actions with controls on the Parameters tab. You may also refresh the Thumbnails tab, enlarge or reduce the thumbnails, and change the zoom levels. Reports and graphs appear as placeholder objects on the Thumbnails tab. For layout purposes, you may want to dock or reposition the Properties window. You can dock the Properties window on all four sides of HTML Composer. When you choose to dock the Properties window on the top or bottom, the columns are split in half. Click the Properties title bar on the Properties window. The Properties window appears as shown in the following image when you double-click the title bar. Drag the Properties window to the side of the screen that you prefer, or it can float in the middle of the screen. Release the mouse when the Properties window is on the side of the screen that you prefer. If you dock the Properties window on the bottom of the screen, it will appear as shown in the following image. To undock the Properties window, click the Properties title bar, then move the window to the desired location in the layout. You can layer objects that are added to the page layout by using the object right-click menu, as shown in the following image. Bring to front. Moves an object to the front so that it is stacked on top of every other object it overlaps. Send to back. Moves an object to the back so that it is stacked below every other object it overlaps. When using any of these commands, the stacking order of the object will change. This is reflected in the z-index property in the Properties window. The z-index is the stacking order of a specific object. Object or page is clicked. Object or page is double-clicked. Mouse pointer is moved down. Mouse pointer is moved up. Mouse pointer is moved over an object. Mouse pointer is moved away from an object. Key is pressed and released. Object is the current focus. Object is not the current focus. Before a control is populated. After a control is populated. Value within the control is selected. Value within the control is changed.